Every married couple fights. But how you and your spouse deal with hot-button issues speaks volumes about the health of your marriage. 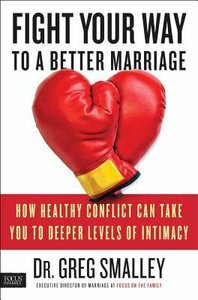 Dr. Greg Smalley explains how conflict can provide an opportunity to break old, ineffective patterns and lead to greater trust (and intimacy) once you get to the other side. It can also reduce tension as emotions are vented and stress is released. Smalley teaches that conflict is driven mostly by fear-the fear of being disrespected or taken for granted, the fear of powerlessness, and the fear of rejection or inadequacy. What can assuage these fears, he says, are intimacy, respect, validation, love, and connection. If conflict is poorly managed, issues can explode like a massive volcano, leaving spouses and family members in its wake of destruction. Written with a candid and inspirational approach, Fight Your Way to a Better Marriage will give you all the practical answers, tips, exercises, and inspirational stories you need to have a fulfilling, happy, trusting, and intimate relationship. About "Fight Your Way to a Better Marriage"